Hockey might be on its way to Sin City. Although unconventional as a hockey town, the NHL is considering Las Vegas, among a handful of other cities, for its next franchise team. The league is looking to add another franchise (or two) to its Western Conference, which has two less teams than its Eastern Conference. Quebec City, Vancouver, and Seattle are also being considered. As the birthplace of hockey, Canada would be an ideal place to put a new franchise since there is a high market demand for the sport. If you would have asked me a few months ago where I thought the new team would end up, I would have said Quebec without hesitation. After leaving Quebec in 1995, the Nordiques moved to Colorado and became the Avalanche. Quebec still produces t-shirts with the Nordiques logo on them, and there have even been a few rallies dedicated to bringing the team back. Despite my nostalgia to see the Nordiques take the ice, it seems as if there is very little chance of a return any time soon. Unfortunately, Quebec doesn’t have the luck of geography. Because the league is looking to add teams to its Western Conference we can strike Quebec City from the list. While we’re at it, let’s strike Vancouver, too. The odds that Commissioner Gary Bettman will agree to put another competing team in Vancouver are slim, even though dividing the Vancouver fan base in half still leaves more fans than the typical NHL team. Let’s give another city a chance. Seattle, on the other hand, is burning the candle at both ends trying to find both an NBA and an NHL team; whichever team can be acquired first will get to call Seattle’s new arena home. So far, Seattle has had two potential pro-basketball bids fall through and has had nothing notable on the hockey side of things. The city is stuck playing a waiting game until 2017, when the city’s memorandum of understanding runs out. While Seattle might want a hockey team, the city certainly isn’t jumping at the opportunity to prove it any time soon. And this leaves us with Las Vegas. Vegas may be the underdog in this fight, but it’s an underdog that knows the power of great PR. Potential future owners Bill Foley and brothers Joe and Gavin Maloof are on a mission to prove that Las Vegas is worthy of its first ever major professional sports team. 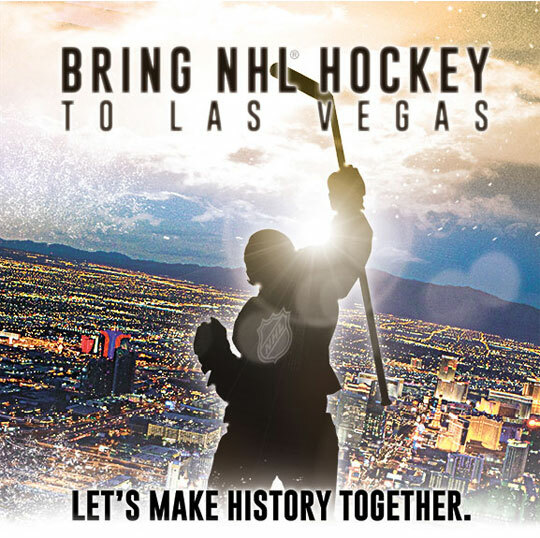 The trio has launched an impressive PR campaign called Vegas Wants Hockey with the slogan “Let’s make history together” as the tagline. The campaign has an active presence on Facebook, Twitter and Instagram, and even released a TV spot to spread the word about the team. Skeptics are questioning if Las Vegas’ status as a city that never sleeps can sustain a major sports team since many work odd hours or commute from other parts of Nevada. This raises some doubt as to the longevity of a major league team. Foley didn’t seem fazed by the skepticism. He was quoted in USA TODAY saying that a lot of Las Vegas residents are transplant hockey fans from other cities. He cites his marketing team’s research, which estimated 130,000 hockey fans live in the Las Vegas area and live within 35 miles of downtown Las Vegas. In order to prove to the league that Vegas has the interest and the market to sustain a team, the potential owners decided to test the waters by selling season-ticket deposits. The drive opened Feb. 10th and reached half of the 10,000-ticket deposit quota in just a day and a half. Because of the whirlwind excitement surrounding the ticket sales, Clark County officials are even in the process of naming February “Vegas Wants Hockey” month. The fans are definitely ready for hockey, but are the casinos? If the franchise wants to be sustainable in the long run, the owners must get the casinos on board. This is a little bit more difficult of a task, considering that the casinos control virtually everything from hotels to food to entertainment. Unless the casinos let their patrons out for a few hours to go to the games, it’s no dice for the budding franchise. Thankfully, MGM Resorts International and Anschutz Entertainment Group (two big corporate players on The Strip) have partnered up to privately finance the team’s arena at an estimated $375 million. Foley-Maloof is also working on selling the arena’s 44 luxury suites to casinos and other large corporations. This is a great tactic by the owners because it will bridge the gap between the franchise and the casinos, building the foundation for great partnerships in the future. Out of all the cities being considered, Vegas is the first (and only) to have a season-ticket drive. While the other cities have seen support from fans, there has been nothing comparable to what Foley-Maloof are doing in Vegas. Putting a professional hockey team in Las Vegas is a definitely a gamble, but it has the potential to not only survive, but to thrive. Vegas is a big city with a wide variety of entertainment and nightlife options; adding an NHL team will give the city the one thing it’s missing: sports. With the MGM-AEG arena finishing construction next April, it’s highly likely that Las Vegas could be joining the NHL for its 2016 – 2017 season. My personal prediction is that Las Vegas will be granted a franchise in the next year or so. I don’t think it’s unreasonable to think that Seattle will be too far behind either, but Las Vegas will definitely be the first. If the teams do not turn a profit in their first six seasons they will more than likely be relocated to Quebec and Vancouver.